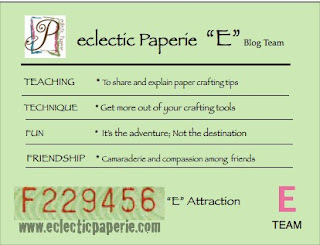 eclectic Paperie is evolving (and we are close to some big announcements). Unfortunately, as part of these changes, this will be the last E-Team blog hop. When the E-Team was created, I wanted a creative, brilliant, reckless group of women who would routinely knock our socks off. They are and they did. Not only did they dazzle us, they also all became dear friends. So I salute Sherry Cheever, Linda Ledbetter, Micki Harper, Broni Holcombe and Starla Nelson for everything that makes you awesome! I'm excited to share a terrific E-Team Blog hop today. The E-Team looked to Disney for inspiration. Just wait till you see what they created. The E-Team is retiring after this Disney-inspired blog hop. 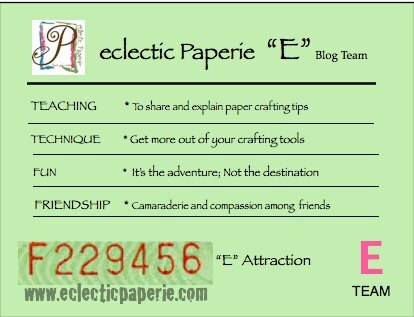 Please visit each E-Team participant on her blog to see what she created. There will be a random winner from each blog. Different eP goodies from each E-Team blog team member. You have from today until Sunday, July 1st to leave a comment. Winners will be announced on the eP blog Tuesday, July 3rd. Leave a comment on this blog. Tell us what you liked most about The E-Team. There will be 2 lucky winners chosen there to win one of the famous eP Grab Boxes. You know those will be filled to the rim with lots of eP goodies. Enjoy this final E-Team Blog Hop. Be sure to mark their blogs and visit them often to see what they are up. They have many more chapters to write as their paper adventures continue on. Hope your day is filled with Pixie Dust! Farewell to you Daisy, and thank you for sharing your blog with us as long as you have. I've enjoyed following you and the great team of artists. I love this final theme. So fitting for you as a fond farewell.Best wishes to you! So sad to see this end! I have so enjoyed your team and all their wonderful art and inspiration and friendliness. I am happy for you to be starting a new exciting chapter, but sad to have this end. Best of luck Daisy and thanks for the ride! I can't believe I've only just discovered you, and it's coming to an end. Reading the blogs around the hop, it's clearly been an amazing ride, and I'll continue to follow them all individually. Good luck with everything in your future! I've been so blessed by how the team has expressed & shared the heart of themselves - so that is my favorite thing. Sad to see you go, but very happy for you. I'm inspired time and again by the fabulous team you assembled. Thanks so much for a great give-away. What I liked best was the diversity of the team. I have learned a lot from all of them and will miss this blog a lot. Good luck at Disney. Daisy, thank you for sharing your creativity and inspiring so many to find their on dreams through art. May all your dreams come true. Wishing you all the very best for the future Daisy...may the best be still yet to come! Best wishes on your Disney journey- it sounds like such fun. We will miss you! sad you are leaving, but glad you are going....on to new heights and adventures!!! I love all the inspiration that you have provided! Thank you and good luck! The inspiration the dt members gave us was and still is amazing. Enjoy the new journey that lays before you. All my best wishes on your return to "The Happiest Place On Earth". Thanks for having the Disney Blog Hop. I've already seen Linda's journal page and it is sweet! Now off to see the others. Love the inspiration! Very sad to see you go but excited that you have a new adventure to pursue, thanks for all your inspriation. Love your quote today. Best of luck on your new ventures and adventures. I will miss the amazing collaborative talents of this crew but will continue you to peek at their blogs. So sad to lose one of my favorite blogs. Best wishes for your new future with Disney. Best of luck in your journey. You will be missed. Farewell to the eTeam but I'll be looking for their beautiful creations in other corners. Good luck and much joy in the next adventure! Daisy, I know you will enjoy the new path ahead! I enjoyed each designer's projects. They did a great job. Oh how I envy you. I'd move in to Disneyland if they would let me. I must say that I am very sorry to see the E-Team go. I have gotten so much inspiration from you gals. TFS with me and the best of luck to you and all your wonderful team.Thanks for a chance to win some great give-a-ways too. Daisy, many blessings on you and your new venture - returning to something you love with new eyes! Best wishes on your move back to that happy place. Your design team has been inspiring. Best wishes to you in your new adventure. Sad to see the E-team and blog hops end, but I have gained so much inspiration from them. I've loved their diversity and creativity. all the best to you Daisy and the E-Team!! i've enjoyed the team and the hopping and by hopping meeting and exploring lots and lots of other great artist!! I always enjoyed seeing the diversity in the artwork that your team has exhibited. Good luck with your new venture! My favorite thing about the E-team is that each artist offered a different creative perspective and that their personalities seemed to shine through their projects!! I've only just found the E Team but I've been to many of their blogs in the past. Love the creative style, the willingness to share & the quirky fun reading on the blogs. Wishing you the very best on your new adventure, what could be better than Disneyland. Thanks for having a last blog hop. I've really enjoyed the hops and I'm sorry to see this end. But I hope your future holds everything you want it to, and more! Best of luck to you, Daisy. I hope all of your dreams so come true. Best of luck to you Daisy. Will miss EP and the blog hops but I am glad you are following your dreams and doing something that makes you happy! I have loved the blog hops. The DT is incredible and I have found such inspiration from all of their blogs. I will miss the E team blogs and the store. But, you must follow your dreams, Daisy. Wishing you the best of everything! Daisy, I wish you joy in returning to Disney, and I am thankful for the inspiration you provided and gathered for us. Seeing the E-Teams creations and reading the stories behind their creations are my favorite parts of this adventure. I just found you and you are leaving! Your DT is fabulously gifted! I've spent some time on each blog and I am inspired to spend the rest of the day in my craft room. Thank you and good luck! Your first challenge got me into art journaling. While I have barely got my feet wet, it's been fun trying out new techniques, stamps, inks, etc. As soon as I saw your post about this final challenge I put on my thinking cap and have nearly finished my own Disney page in my art journal. Congrats on returning to your dream job!!! You've done a marveous job with eP...we'll miss you! Bon Voyage Daisy! I'm sure your future holds fun and excitement! Thank you for your hops and your wonderful shop! So sad this see this. I will miss all the creative projects by the DT and your wonderful giveaways. Daisy, I wish you the very best in your new endeavor at Disney. Sniff, I will really, really miss you and these awesome hops. I so look forward to them! You have one of the very best crews and I have them all bookmarked but I will really miss you!! What I like most about this team is 2 things. The broad range of art each member brought to us. Secondly, reading their blogs....what a bunch of fun and humorous ladies!! Best of luck to you and wishing you the best in all your future endeavors. what I have read on their blogs. chance to win some awesome gifts. Excited for you Daisy! I'll miss these creative blog hops and your team! Enjoy your new adventures! You will be missed Daisy. Will definitely miss seeing all the inspiration created by the E-Team. I have not long discovered this blog and have enjoyed browsing. SO sorry to see it all end but I wish you well in your coming ventures and I can keep following along with the E Team's work. They are a wonderful team of artists! I'm so sorry that this is the end of this line but I hope that your future is bright! Thanks for assembling such an amazing team! I haven't been a follower for long- I wish I'd found you much earlier, but the hops I followed were full of amazing projects and some techniques I'd never dreamed of. What a great learning experience! What a great ride! Thank you and best wishes! Another fabulous blog hop. I'm sad for the ending, but an ending is always a new beginning and I wish you all the best in returning to your dream job. I also want to thank you for the opportunity I had to join your fabulous team as a guest blogger. What an honor that was. One of the things I've liked best about the design team is the extreme diversity of style they represent. I was never disappointed with the wonderful creations. Sorry to see you go but, glad to find out that you are getting the dream job. Lucky you! So sorry to see you go & close the store. Good luck with returning to Disneyland and best wishes to your future. Good luck with your future! The ladies were all so inspiring and their projects were always great. Ah, Daisy...so happy for you. And, selfishly, a little sad for all of us. Glad you are working with a buyer. I knew the right person would come along. I am going to miss the friendliness of the E-team. I've developed a personal correspondence with a couple of the members. I am going to miss the way they have shared techniques, boo-boos, struggles, discoveries and the joy of art with us all. I think this team is unique in that aspect...a level of real sharing. That cannot be replaced. I wish you well...thank you for 5 wonderful years. Hugs! Best of luck on your new adventure! I'm going to miss all the inspiration, and especially the tutorials! Good luck on your journey! You and the team have been such an inspiration. Much good luck Daisy! I'm happy for you but sad about the team. I so hope you find the right person for the store. Huge shoes to fill for sure. The favorite thing about the team? Generosity of spirit and talent...and so very positive! Always yes you can which I certainly need. All the best and thank you so much for YOUR generosity of spirit, talent and of course prizes! Daisy- first, I wish you tons and tons of happiness in your new adventure!!! What do I like most about the E-Team? The variety, creativity and willingness to go outside the lines. There is ALWAYS inspiration to be found with the E-Team. ALWAYS. good luck with your new endevor. I just recently discovered this website and it is really inspiring! really pretty projects! sad to see this great company end. but that is life isn't it, change and endings... and new beginnings. wish you loads of luck. Congrats, Daisy, on returning to a job that you truly loved, how many of us can say that? I look forward to your presence in the art world where ever you may appear. How come I never connected the dots that lead to a Disney connection? - always so positive and encouraging and your name is DAISY! Thank you, thank you. I choose to say "See you later" instead of farewell... I know I'll see you girls somewhere. Thank you for an inspirationasl "stop" on my Journey, I've been so blessed and inspired by the E Team Thank You Daisy! Wish you all the best on your Journey as well! Oh... 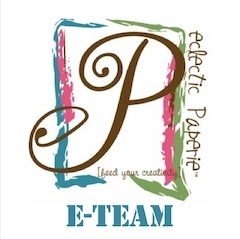 I was supposed to tell you what I liked most I so enjoyed the versatility and creativeness of the E-Team! The projects inspired me and "sparked" some new artistic expression in me! I loved seeing what each one did although they always had the same theme to work with... very inspiring!!! I truly hate to see you go-but wish you and yours all the best.Peace on! I have enjoyed these blog hops for a year or more now. I wish you all wonderful journey's from here. Thanks for sharing all you talents. Best of luck to you Daisy in your "return to Disney"! It sounds like a great journey! I've enjoyed looking at all the design team's blogs... you are all such talented artist! Oh, Daisy, I have absolutely love and eagerly anticipated your team's blog hops. The ladies are SO talented and creative. You have no idea how much I will miss them. But I certainly wish you well. . . have fun!!! So sorry to see ep go but I wish you much success in your next endeavor, Love this hop - great pages and love the quotes. Congrats on your new adventure, will miss the blog hops and all the inspiration to be had there. Blessings! Hey My Friend. I hope you know that I only wish you the absolute best with your Disney adventure. Even though EP is coming to a close, I hope that we will keep in touch. Your friendship has meant a lot to me and has added memories that will never be forgotten. I love all the inspiration from the Eteam. Good luck on your next adventure! Darn, darn, Daisy. I'm writing with mixed emotions, being happy for you and your new adventure and also sad to see you and the E-team leave. I've so enjoyed seeing the creations of the gals, learning new techniques and being inspired to step out and try new things. Happy trails, Daisy. Disney is fortunate to get you!! Sorry to see this go, Daisy. Your team was very creative and well chosen! What I liked most about the e-team is that although they all have their different styles every one of them is inspiring. Just wanted to say Thank You for sharing and for the great design team. I have enjoyed visiting the blogs and learning. I'm with butterfly. I too cannot believe that I just recently found you guys and now the posting and the awesome tutorial's are over from the E- team. My favorite part were the blog hops and pretty much all the posting's. I enjoy the way that each of you would list all the items that were used to create the current piece. That really comes in handy for beginning crafter's like myself. Give's us a good feel on what items to use and how to use them and where to find them online. I dont have alot of choice's for craft item stores in this small town so I do most, well ALL of my craft tools shopping online. That's my favorite thing. I have subscribed to everyone's blogs in the last few months and I'm sure I will keep seeing some awesome stuff being created. Daisy I do hope all of your hope's and dream's come true for you. Wow what a fantastic job it must be to work in such a lively colorful and happy place like DisneyLand. How lucky can you be, right? Good luck to you and all your venture's and Thank You for introducing me to all these great new crafter's I have just met. You are all so talented and generous. Enjoy!! this seems to be the time of the year to say so long...but I know good things await such talent. I love the inspiration I can find here with the ETeam. Farewell and thank you to a wonderful team!!! Thanks for the inspiration. That is what I will miss the most. Such a diverse and talented group. Their projects took us on a creative journey a couple of times a month! Thanks for providing such fabulous inspiration along the way - good luck with whatever lies ahead - you deserve every success. I am so sad to see this chapter close. It has been such a joy and inspiration to blog hop this wonderful and creative team.The unique creativity of this talented team is definitely my fave reason for hopping. Have a magical adventure working at Disney. I know it will be amazing. " Remember, it all started with a mouse." I too am a huge Disney fan. The two things I've enjoyed is the inspiration from the blog team and following the blogs! Wishing you well! Thanks for a fabulous final hop! Good Luck on your new adventure! I love Walt Disney's creativity. Thanks for all of your inspiration. I will miss this blog very much. Best of luck to you Daisy! It's been very fun following along on your blog. Love your DT blog hops... an amazing team of artists! I am really going to miss Eclectic Paperie-bit I am thrilled for you.When you have a chance to follow a dream-you got to go for it.No one knew that better than the Walt. I just love all your designers-I have learned so much.The inspiration was incredible,but I loved their tutorials!They were so detailed and that made them easy to follow.They are all great artists and teachers. Peace be with you-make happy magic!